The Clinic actively engages with the media to ensure the public and our community is aware of our position on gender-based-violence and what we are doing to prevent and resolve violence against women locally, nationally and globally. Much has been happening at the Barbra Schlifer Clinic. Find out who we have hired, who we’ve said farewell to and learn about some of the initiatives we have been involved in over the past few months. 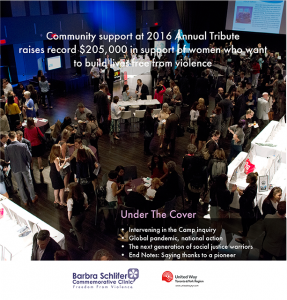 01/2018 – Who will be the 2018 recipient of the Spirit of Barbra Schlifer Award? 12/27/2017 – Thank you for a remarkable year! Here’s what we did.